Forget what you think you know about travel trailers and trailer parks and check out these innovative and modern Airstreams. Recognized by their distinctive, rounded shape, an Airstream is a modern, refurbished take on the traditional American trailer. 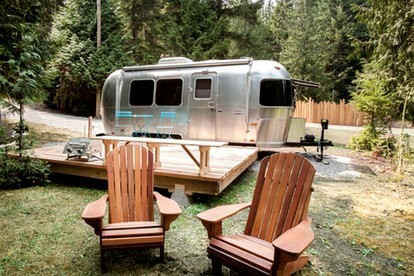 These one-of-a-kind trailers will be vacation rentals that you never forget, with all the comforts of home. Kitchens, living rooms, Wi-Fi, patios, outdoor grills, full bedrooms, and all in a fun and unique package, Airstreams are perfect for couples or friends. Whether you're planning a trip in New England or Florida, Texas or Oregon, we've got the something for you here. Road Trip Airstreams near L.A.